Common sense tells you that a politician who is snapping at reporters' questions and casting sour blame is a politician who is feeling the heat. 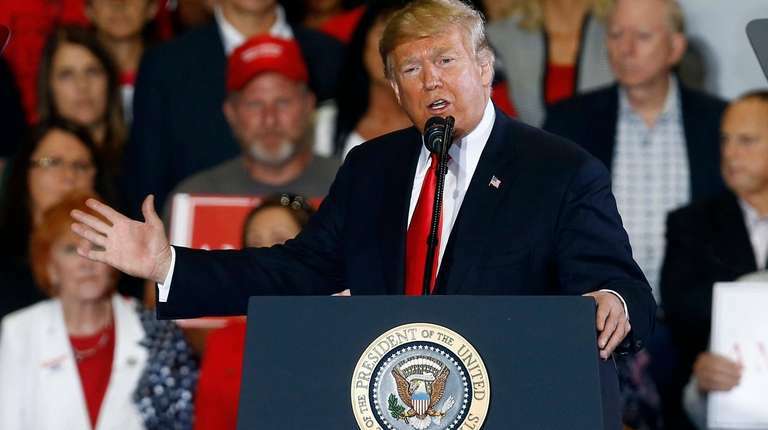 In this way, President Donald Trump ranks as average, even if his public eruptions on Wednesday against Yamiche Alcindor of "PBS NewsHour" and Jim Acosta of CNN seemed especially pungent. The subject of the questions didn't matter. The source of the pressure was clear. The Republicans had lost the House of Representatives to Democrats, as many had expected, and not everyone in the GOP was holding Trump blameless. Crafting bills and negotiating with Capitol Hill haven't proved to be strong points for Trump even when he got to face a legislature of his own party. Now his rivals have won more clout under the dome at his expense. The president clearly wanted to keep his audience from suspecting the obvious — that in some races he may have helped rhetorically poison the waters for members of his own party. Pressure and anxiety due to his party's losing the House would generally explain the schizoid nature of the president's public reactions. First he coyly kowtowed to the likely next speaker, Rep. Nancy Pelosi (D-Calif.) by saying she deserved the post. “She’s fought long and hard, she’s a very capable person, and you know, you have other people shooting at her trying to take over the speakership,” he tweeted. Quickly, however, he began threatening, vowing a "warlike posture" (whatever that means) against Congressional Democrats if they use their recouped power to scrutinize his financial and other dealings. He boasted about the expanded Republican footprint in the Senate, which was also expected because of which seats were open this year. Then Trump took below-the-belt shots at people who lost — as if they should have served him better. For example, with thousands of ballots still uncounted, Rep. Mia Love (R-Utah) trailed in a hard-fought race against Democrat Ben McAdams. She's a Haitian-American and former New York City resident who expectedly took umbrage at Trump's "shithole countries" complaint, reported earlier this year, particularly where he asked: "Why do we need so many Haitians?" Love said at the time that when her parents "pledged their allegiance to the flag and become U.S. citizens, they meant every word of it." Rep. Ryan Costello (R-Pa.) was already retiring. On Tuesday a Democrat won his district by 17 points. "To deal with harassment and filth spewed at Republican members of Congress in tough seats every day for two years because of the president; to bite your lip more times you’d care to; to disagree and separate from the president on principle and civility in your campaign; to lose because of him, and have him piss on you, angers me to my core." Trump's concern for himself above others also drove the long-anticipated announcement that Jeff Sessions was out as attorney general. Trump has pilloried Sessions over and again, ever since the former Alabama senator recused himself in the Russia-meddling probe that under special counsel Robert Mueller has produced charges against 32 people and three companies and a half-dozen guilty pleas. The president has tapped as Sessions' interim replacement Matthew Whitaker, a partisan ally already in the Justice Department known to take a critical eye toward the Mueller probe. The lingering story: Is it too late, or will Mueller's work to date further damage the administration? Trump thus makes a fool of another Republican senator, Lindsey Graham (R-S.C.), who vowed in July 2017 there would be "holy hell to pay" if Trump fired Sessions. This week Graham said: “I look forward to working with President Trump to find a confirmable, worthy successor so that we can start a new chapter at the Department of Justice." That isn't surprising in a week when Sen. Ted Cruz (R-Texas), whose wife and father were insulted by Trump, gamely greeted the president's support in what proved to be a successful re-election race.